Instant Photography is quite popular and favorite amongst many photographers. Jollylook is a unique instant camera, since its made out of recycled paper and cardboard. This camera can take beautiful pictures, without the need of any electricity, since it is a manual analog camera. Jollylook camera uses the Fuji Instax Mini film and it's a simple and light-weight camera. The aperture of the camera is a diagram that can take on 7 values: f/8, f/11, f/16, f/22, f/32, f/45, and f/64. The shutter of the camera can be set to 1/250, 1/160, and manual. 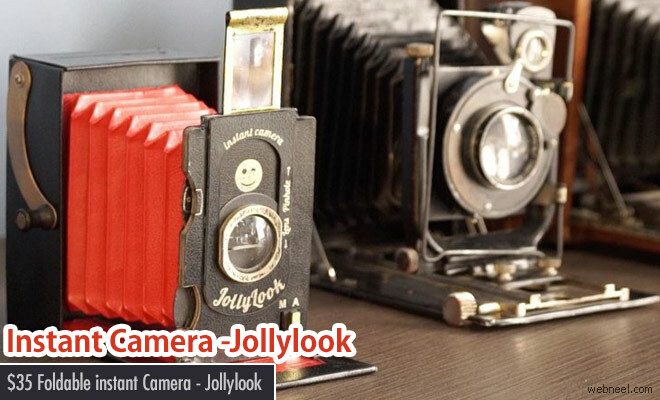 Jollylook camera was designed by Oleg Khalip and his primary goal was to build a camera without batteries. It costs around $35 and this camera is meant to be used during dry weather conditions. This is a great camera to gift your children, so they can start practising at a very young age. Jollylook camera is a little bigger than iPhone's camera box. The camera, described as “retro with a little steampunk,” features a red paper bellows system and collapses into a small black box. The film cartridge fits snuggly into the back while a fresnel lens viewfinder lifts up from the front (and shoots back down with the click of the shutter). The camera features a 110mm lens that can be pushed up to turn the Jollylook into a pinhole camera. The aperture can be adjusted from f/8 to f/64. Environment friendly - easily recyclable, as dangerous to the environment as a banana peel.